London (AFP) - A new Polish cycling team is targeting Tour de France champion Geraint Thomas, offering him a contract as he is yet to sign a new one with Team Sky. The 32-year-old Welshman -- who dethroned team-mate Chris Froome as Tour champion last month after years of loyally working for Froome to win the race -- received the offer from the Poland-based CCC WorldTour -- which is due to compete in 2019 under that name when CCC Sprandi Polkowice and BMC Racing merge. 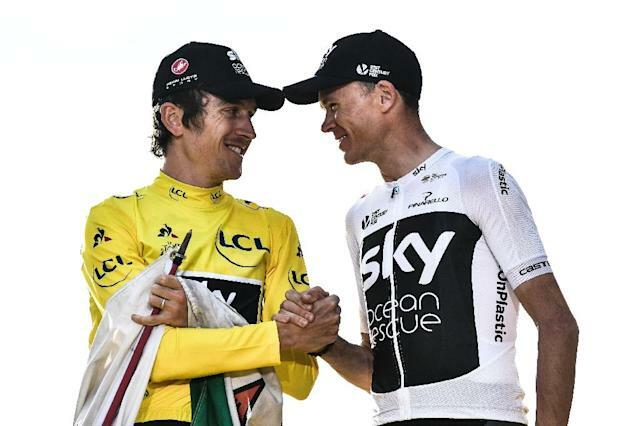 Thomas has said he feels Team Sky and their chief Dave Brailsford are like family having been with some of them since he was 17 but with his contract up at the end of the year he won't accept any old offer from them out of sentiment. The Daily Telegraph had suggested that Team Sky were prepared to offer £3,500,000 ($4.5million, 3.9million euros). "We have made an offer to him and we are waiting for a reply," CCC WorldTour's sports director Piotr Wadecki was quoted as saying in the British media. "He won the Tour de France, but will he be number one? There's Chris Froome who will want to win. "With us, Geraint would already know in January that his goal is the Tour de France and we would definitely focus on him." Brailsford has said he was "pretty positive" Team Sky remained the best home for two-time Olympic team track pursuit champion Thomas. The Welsh Tour de France champion is due to be heralded back in Cardiff later on Thursday in a civic reception expected to be attended by thousands of people.